Stock ingredients can include everything from vegetables to herbs and meat to fruit. I’m always looking for ways to save money. Aren’t we all? So, when a genius friend of mine told me that he makes stock out of all the vegetable scraps he creates while cooking his meals I couldn’t believe he had thought of it before me. I quickly adopted the process in my own life. Not only does it save me money, it also helps the planet by putting what would otherwise go in the waste bin to good use. Now all those bits and trimmings from carrots and celery, all those apple cores, and all those meat scraps and kale stems get repurposed instead of thrown away. Its is like making something out of nothing. 1. Save scraps from nearly every vegetable you cut, trim, peel etc. You can really use any and all vegetables. I even include apple peels and cores. Herbs stems work really well too. I tend to use less brassicas (cabbage, broccoli etc.) because they tend to overpower the flavor. I also skip tomatoes for the same reason unless I know I am using the stock in a way that tomatoes will be a welcome flavor. The real key ingredient is onions. They are used in most stocks and give great flavor, so just throw some in, you will thank yourself. Collect all these waste trimmings after each meal and put them in a freezer bag or container and store in your freezer. Keep adding to the container until you have almost enough to fill your stock pot. 2. (If you eat meat) Save scraps, bones, fat, gristle, and whatever else you don’t eat from every piece of meat you cook. Even the ones that have been gnawed on by you and your loved ones. They get boiled so no germ risks here. Seriously. You can add the meat and bones into the same container as your veggies, or you can put it in a new one. You can even have a separate kind of container for beef vs chicken vs pork vs fish if you so desire. I am lazy so I keep it all but the fish together in one. It makes for a very rich, hearty stock. 3. Days, weeks, or months later when your freezer containers are full enough to fill up your stock pot you can finally cook the stock. Put all the frozen scraps into the pot until it is nearly full. Add enough water to cover them. It’s really that easy. The ratio really doesn’t matter. Really. Some people say 1:1, but I just wing it and it always turns out. Why over complicate? 4. Place the pot on the stove and bring it’s contents to a boil. Let boil for 10 minutes-ish and reduce to a simmer. Let it all simmer together for a long while. 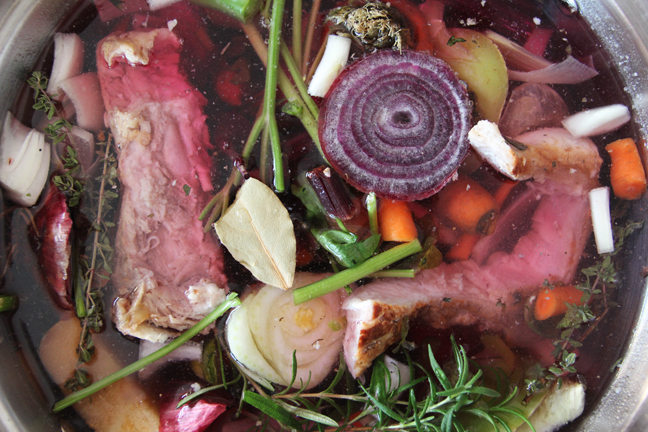 The longer it simmers the more nutrients and tasty bits will cook into the stock and the better it will be. A good rule of thumb is to cook veggies, fish, and poultry for at least 1-2 hours and other meats for at least 4 hours. Stir infrequently as the stock cooks. If the liquid level gets below the scraps, simply add more water. 5. Remove from the heat and let cool. Use a strainer to drain the liquid into a large bowl or pot. You can either transfer it directly into freezer container/use it right away, OR you can use a cheese cloth to line the strainer and strain the stock further to get a more translucent liquid. Ta-da! Stock! My version of these stock making rules are super simplified because I want to show you just how incredibly easy it can be. If you think about it, it basically takes none of your time. Just a few minutes for each step. You can make things more complicated by being more precise on ratios, including some herbs like bay leaves, leaving out certain veggies, or roasting the meat bones for 45 minutes before boiling. It all depends on how professional you want to go vs how easy you want to make it for yourself. For more tips check out this article on Stock Making 101. But, honestly, it doesn’t need to be complicated. If you throw food scraps in boiling water, let them cook, then drain it…you will get stock. Easy-peasy. This is fantastic! Such a great idea. Thanks! However, all the credit goes to my friend Nick. He beat me to it. What do you think about using the crock pot on high? I think that could work. Depending on your crock pot you most likely will need to up the cooking times. I would still recommend boiling for about 10 minutes then putting everything in the crock. Try it out and let me know how it goes! The only real risk is that the lower heat won’t get as much of the flavor out of the bones. But my crock on high has enough of a simmer that it should extract all of the goodness… so hopefully yours will too! This winter needs lots of soup! How long have you had worms for? Do you use their castings in a vegetable garden?